Abram Efros's brilliant essay on the great artist contains the following disappointingly unfair lines. 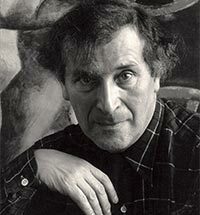 "It can now be said that Chagall made us pay a high price for his Jewish form of stage imagery. The theatre is simply not in his blood. 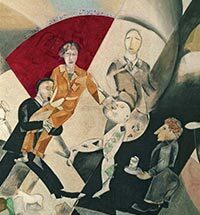 "1 These words reflect the conflict that arose in 1921 in the Jewish Chamber Theatre between Marc Chagall, on the one hand, and director Alexei Granovsky and Efros himself, in charge of design, on the other. 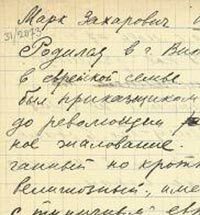 Today this distant conflict and Efros's assessment of it merely serve to illustrate how stupendous, how overwhelming was the Vitebsk master's work in the theatre. 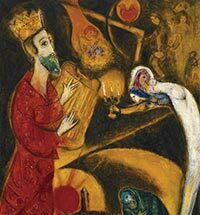 For the best part of a century Marc Chagall showed on many occasions that there was a rich vein of theatre in his blood. 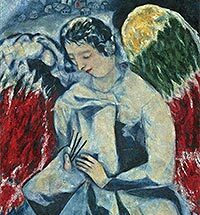 Some years ago the French critics reviewed the later work by Chagall as being repetitive, decorative and commercial. 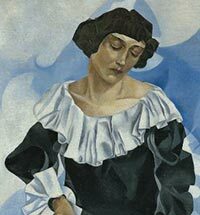 They placed greater homage and importance on the artistic innovation of his earlier work produced in Russia, and his first visit to Paris (1911-1914). Conversely the public, though, do not share the same opinion. At each successive exhibitions, the majority of viewers appear to universally agree that the later works from the artist's vaste oeuvre are part of a harmogenized continuum which predicate and conclude his entire works. 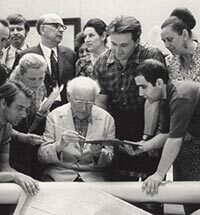 Evidence is partly due to the number of major inclusions of post 1945 works in exhibitions throughout the world. Countries have increasingly demanded a holistic overview of his episodic creative output. 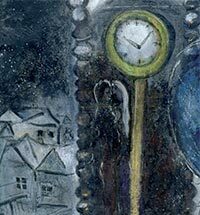 Each country receiving a Chagall exhibition relates to it with their own historic and national perogatives. 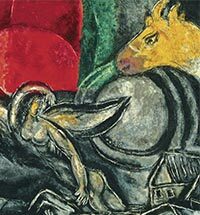 What Chagall does, by radiating his exquisite colour combinations and iconographical elements provides and emphathizes the different needs for the ever changing generations of viewers. Iconographical elements like exuberant flower bouquets, lovers and biblical interpretations are imbued with a universal language of peace, and consequently many diverse cultures find significant reference points in his work. Ever since my early childhood, I have been captivated by the Bible. It has always seemed to me, and still seems to me today, to be the greatest source of poetry of all time. Ever since then, I have searched for its reflection in life and art: the Bible is like an echo of nature, and this is the secret I have tried to convey.